The Maitake (Grifola frondosa) is literally translated in Japanese to dancing mushroom. It is highly regarded in Asia for its culinary and medicinal qualities. Mushrooms contain active components known as polysaccharides. As a dietary supplement, take 1 Vcaps 1 to 3 times daily. Best taken with NOW Vitamin C supplements. 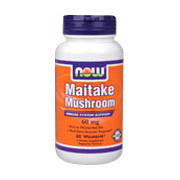 Maitake Mushrooms 60mg is shipped in a discrete, unmarked package. Orders are processed immediately and usually take about 3 to 5 working days to be received. We do ask that you try it for 2 to 3 weeks to feel the full effects. Any information received is used only for order processing and shipping purposes. Your information, such as e-mail address, will never be disclosed to a third party.